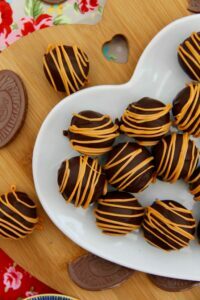 Luscious and scrumptious Terry’s Chocolate Orange Truffles that are perfect for a present, or your Valentines day treat! So yeah, I couldn’t resist this recipe. I would apologise, but I am not sorry – its just so yummy! 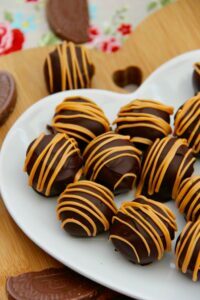 Like seriously, I made these for my family and friends as a test recipe for Valentines day this year, and I think I must have eaten half the batch myself! People say I am greedy… I say I am a Terry’s Chocolate Orange addict. Over Christmas I shared my Chocolate Truffles recipe, dressed up as little Christmas Puddings and they were a massive hit – along with my Oreo Chocolate Truffles I was inspired to combine them and make these beauties. 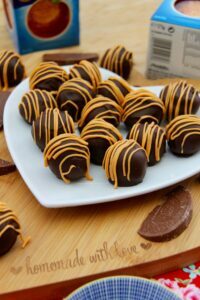 The truffle mix itself is a lot simpler than most, and I wanted to keep it that way as I didn’t want to overpower the flavour of the chocolate orange! I did however, like the Oreo Chocolate Truffles, use a biscuit in the middle so that they were bulked out a bit more, and I find they are far easier to shape when biscuit is involved! I obviously love the flavour of Terry’s Chocolate Orange (Like, you’d think I was sponsored by them with how much I go on about it, but honestly – its just a unconditional love.) and truffle form is one of the best. 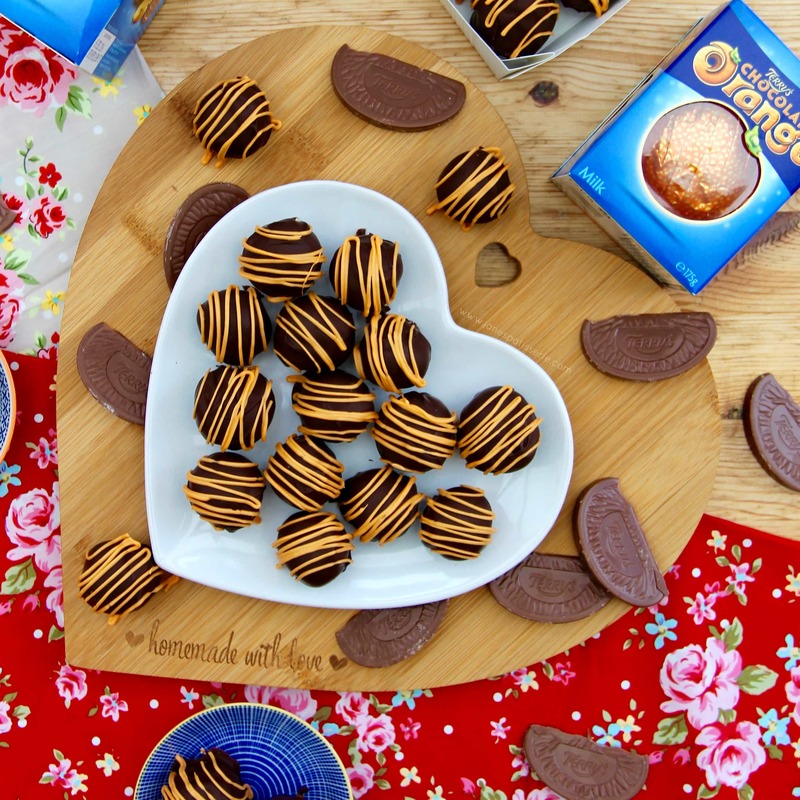 My Terry’s Chocolate Orange Cookies are one of my most popular recipes on my blog, along with my Terry’s Chocolate Orange Cupcakes so its no surprise that these, after I made them for the second time, were a MASSIVE hit with my taste testers! These are made up of few ingredients, and are much easier to make that you think – Enjoy!! – 175g Biscuits – I used Digestives. 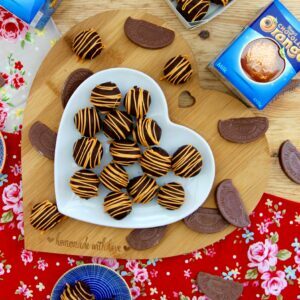 2) Heat the double cream in a pan until its just about to boil and then turn off the heat – mix in the chocolate orange until it is fully combined and then mix the biscuits into the mixture as well. Pour it all into a container and leave in the fridge for at least 3-4 hours, or preferably overnight. 3) Using a cup of hot water, Shape the truffles using a melon baller or two spoons to create small rounds – I dip my melon baller into the hot water each time to clean off any excess and make it easier for the mixture to drop out – I also then, if they are misshapen, quickly roll them in my hands to get a round! 4) Place back in the fridge for a couple more hours or in the freezer for at least an hour so the mixture is very cold again to prevent the truffles melting when decorating. 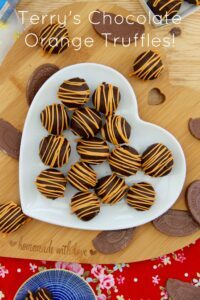 5) Melt the Dark Chocolate for decoration and dip each truffle into it trying to keep the coating light so that not much drips off and rest on a piece of greaseproof paper – once all of them are coated, refrigerate till hard. 6) Melt the White Chocolate, mix in a little of some orange food colouring, and drizzle on and leave to set in the Fridge! Enjoy! Often if my truffles are misshapen I roll them in my hands so that it becomes smoother and hopefully rounder – you might want to wear some gloves for this though, as it can get messy! I use a dipping tool to help me with the decorating of the truffles, but you could also stick each truffle into a cocktail stick and stand them up in some polystyrene so the excess drips off itself! These truffles (if the cream has a good date) will last for 1 week in the fridge! You can obviously decorate them how you like – but this is my preferred method! Find my other Truffle, Sweets and Chocolate Orange Recipes on my Recipes Page! Older Next post: Jammie Dodger Cupcakes! Newer Previous post: Caramac Cupcakes! Just wanted to say thank you so much for this recipe! I am a bridesmaid at my brother’s (quite DIY) wedding in April and I am making truffles as the wedding favours. 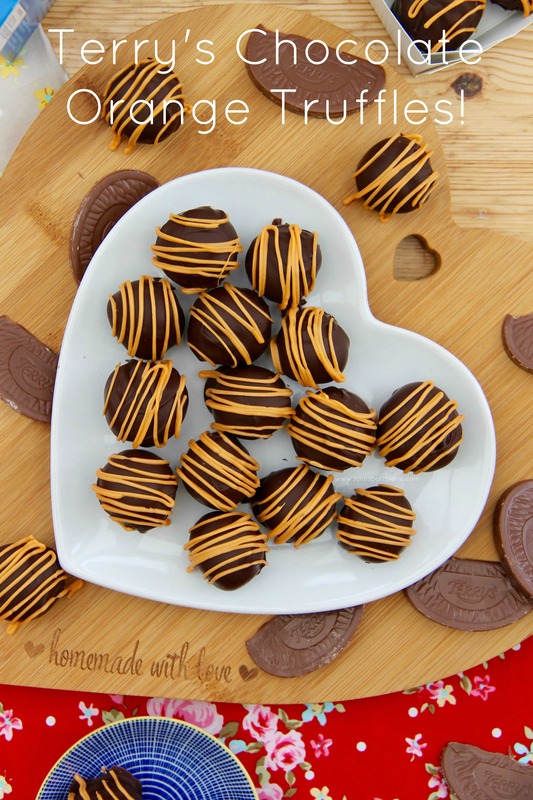 I’ve adapted this using different biscuits and add ins to make different flavours – I’m doing dark chocolate ginger nut, white chocolate amaretti , and the original chocolate orange flavour. This recipe is foolproof, so delicious, and easy to switch up, its absolutely perfect! Thank you! 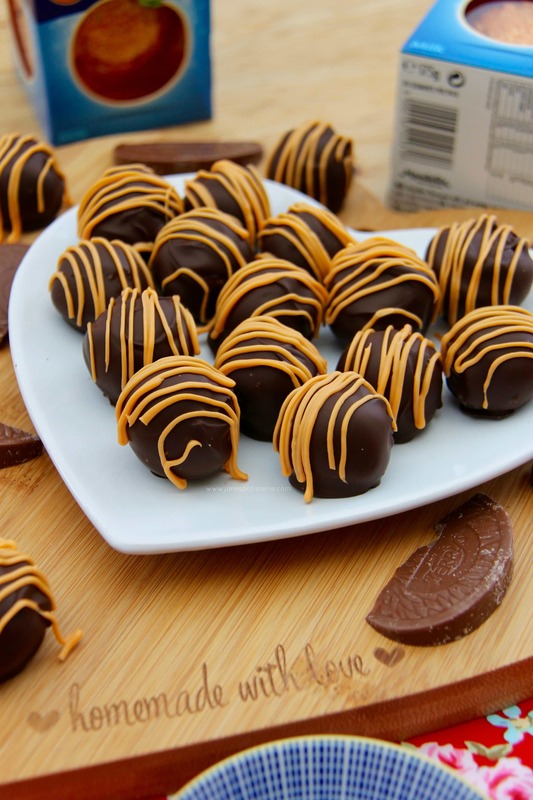 I’ve tried both the oreo and bailey’s truffles and loved them so want to give these a go now. Can you use milk chocolate to cover the truffles instead or would you recommend using dark? Not a fan of dark chocolate so wanted to know what you thought! Love these! Where did you get your dipping tool from?? I got them from hobby craft but you can buy it on amazon! I was wondering if you had an idea for a Christmassy trifle. Prefably not chocolate, was thinking more along the lines of gingerbread/caramel? Love your recipes though! The cheesecakes go down very well in this house!! They can! However once coated it can sometimes tarnish the coating chocolate because of the temperature changes. But you can easily freeze them before coating as well. What is double cream? I did not want to sound foolish. Is it half and half or whipping cream? Thank you. Double Cream is the fattiest liquid cream. Google your closest alternative to the country you are from. Are the biscuits to be completely broken up? i.e could be put through a blender or just cut into small chunks? Thanks! Forgive me, what are the biscuits you’re referring to? I’m really looking forward to making these, but I don’t want to leave anything out! I didn’t see them at Target on Saturday, but asked an employee and they said they do carry them from time to time and that I should check back when it gets closer to Easter. Hmmmm… think I will try elsewhere. Must try these chocolates you know my love affair with chocolate and orange. YUM. 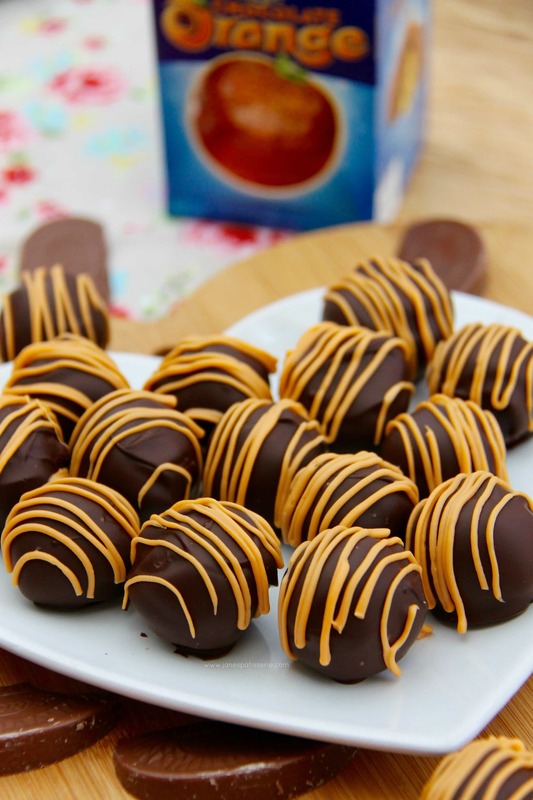 Your truffles look amazing. Ahhh yes definitely try and get them again!! And same, it’s a never ending love affair ❤️ and thank you! !